Two USC fans have been charged for allegedly vandalizing UCLA's on-campus statue and now face up to 3 YEARS in JAIL. Louis Torres (19) and Willie Johnson (18) allegedly hit up UCLA's campus on Nov. 13 -- just days before the Trojans' rivalry game with the Bruins -- and sought to violate the bear statue. Officials say the two men doused the statue in Trojan-colored paint ... and also inked the letters "SC" into the landmark's pedestal. It's interesting ... 'cause in preparation for the big game -- UCLA officials actually boxed up the bear ... which means the vandals had to go the extra mile to get to it ... physically prying open the box to get to the statue. Reports estimate the vandalism caused $15,000 worth of damage ... and now, officials say both suspects could face up to 3 years in jail, if convicted. 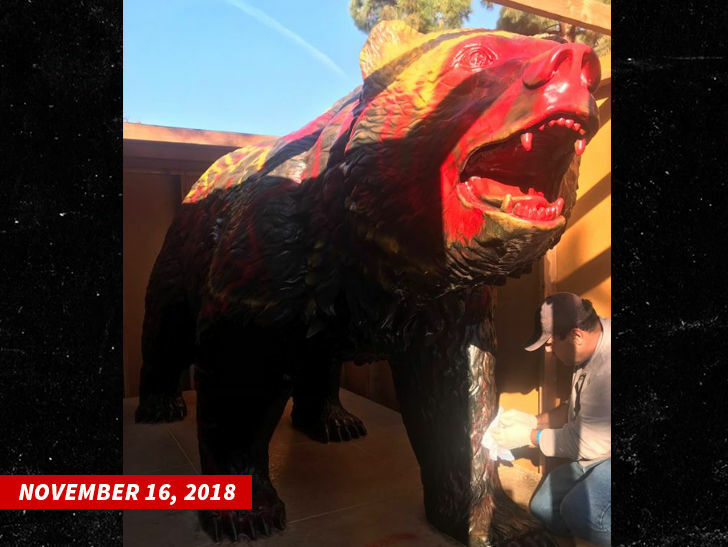 This ain't the first time the Bruin bear has been subject to USC antics ... back in 2009, it was also doused in red and yellow paint -- which caused a reported $20,000 of damage. For their part ... USC fans make sure UCLA can't retaliate by wrapping their on-campus statues in duct tape and having students guard them throughout rivalry week.